After returning to Philadelphia in 2001, I noticed some of my friends had very attractive farm tables that were built on the Eastern Shore of Maryland. I went down and bought a table, and was told it would take 14 weeks because of the back log. After 14 weeks I picked up my table and on the way home realized there was a real opportunity. Four or five people I knew, plus myself, were willing to drive over 200 miles to buy a hand-made table made from reclaimed wood! I asked my partner in our real estate business, Chris English (a carpenter by trade), to show me how to make the tables. As the real estate business exploded, the tables took a back seat until the market slowed down. In the Fall of 2006 I began working on tables full time and have been doing so ever since. Special thanks goes to Alice Nelson Flint of Key Concepts Co., who not only named the company, but also redesigned the beautiful website you are currently browsing! After initially using exclusively old barn wood, we now incorporate wood from old houses and reclaimed rough hewn lumber. A lot of other woods come from logs that are milled by local saw mills and then kiln dried. We have recently been buying more and more from salvage companies as well. We work with several contractors and a transfer station who supply us with old wood from local buildings and houses…which would have otherwise ended up in a land fill! 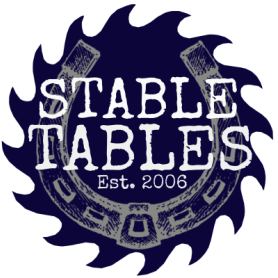 Stable Tables has grown and we have expanded our product line extensively through the years. We have had the privilege of collaborating with top designers, creative clients, entrepreneurs and adventurous restauranteurs...through these experiences we continue to bolster our portfolio. We look forward to the next project...YOURS!